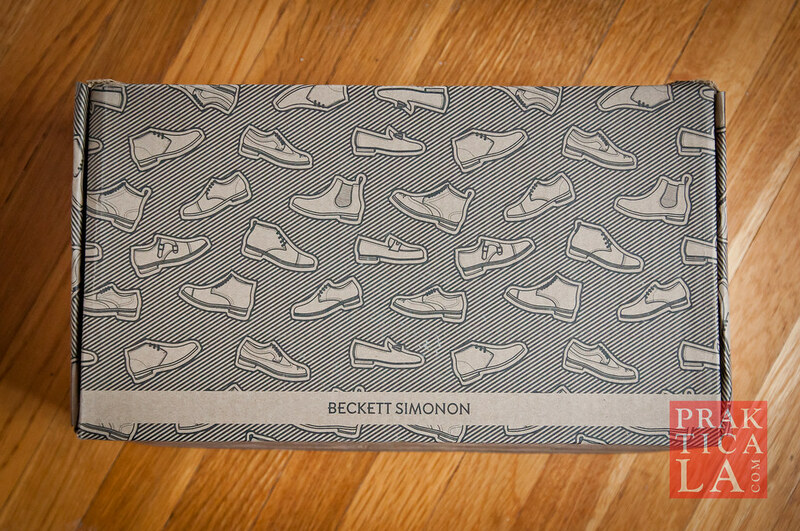 Beckett Simonon is a startup from Colombia that aims to provide high quality shoes at a somewhat affordable price point. 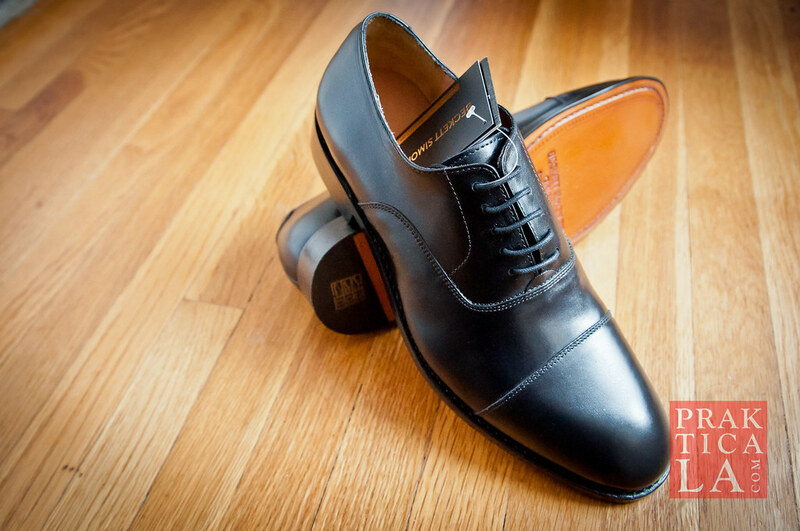 The shoes carry high-end characteristics — Goodyear welting, full grain leather uppers, and leather soles — that are normally found only on shoes in the $300+ price range (more on why these are important in an upcoming post). The company supposedly achieves lower prices by having no “middleman” — they sell the shoes directly from their website as opposed to through brick-and-mortar retail outlets. Consumers obviously also save some money by forgoing a designer brand name. 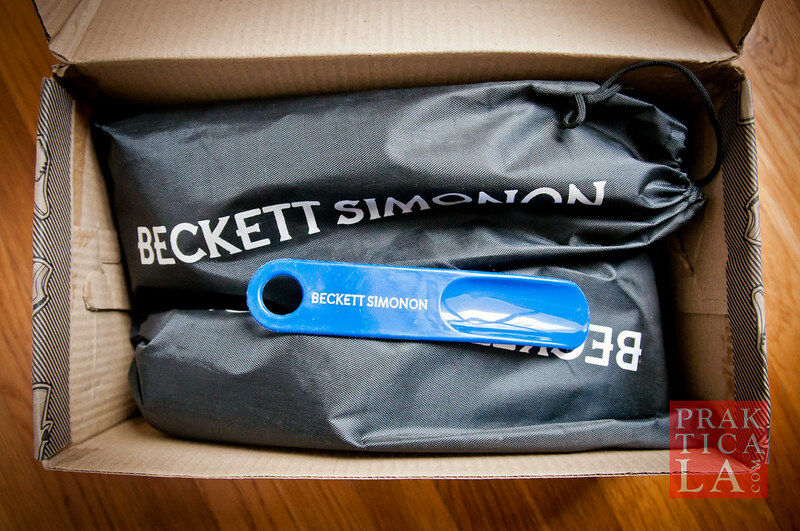 Although I’ve read some negative reports on their customer service, my personal experience with Beckett Simonon was quite impressive. After placing my order, I decided that I wanted to go with a smaller size than the one I had ordered. So I contacted support and Santiago replied to me shortly afterward saying that since they had recently redone their sizing, he would send me two different sizes (shipping is free both ways) along with a return label to send back the one I didn’t want to keep. A few days later I had a box in front of me. I could tell that the company wanted to make a good impression on their customers. In addition to the shoes, the package came with extra laces, individual dust bags, and a shoe horn. 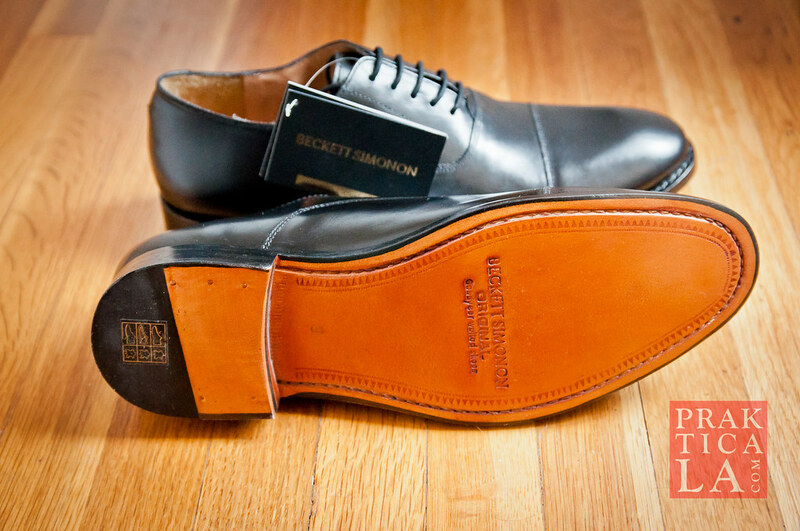 Beckett Simonon states that all their shoes are made with full grain leather, which is the highest grade, and most expensive, of leathers. 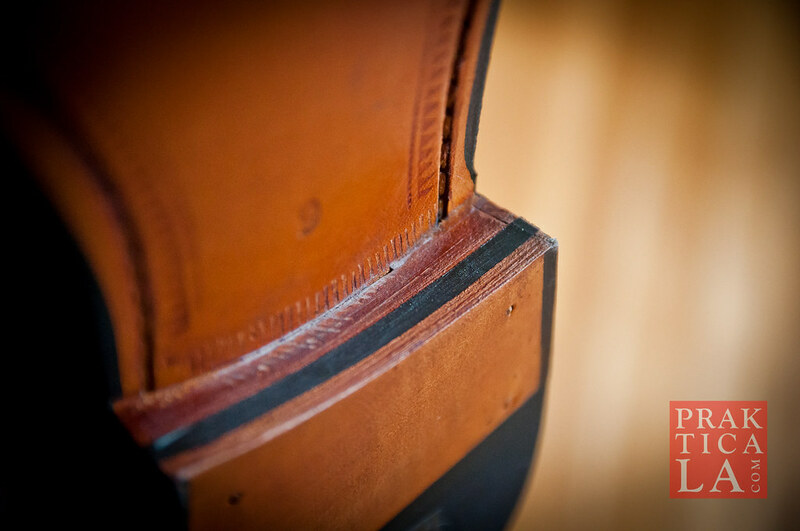 Cheaper, corrected-grain leather (also called “top-grain leather” to fool the uninformed), which is used by the vast majority of dress shoes, even many supposedly “high-end” expensive brands, is more liable to crease, crack, and wear out than full grain leather, which will instead develop an attractive “patina” when properly cared for. 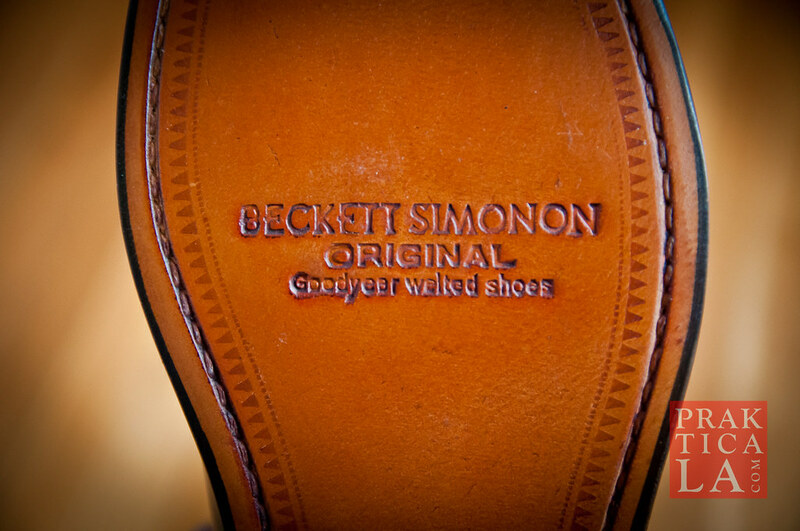 Beckett Simonon’s shoes also feature “Goodyear welting,” which is the most durable (and also most expensive) type of shoe construction. This essentially means that the upper and soles are attached to a “welt” using old-school stitching rather than a crappy gluing or cementing process. 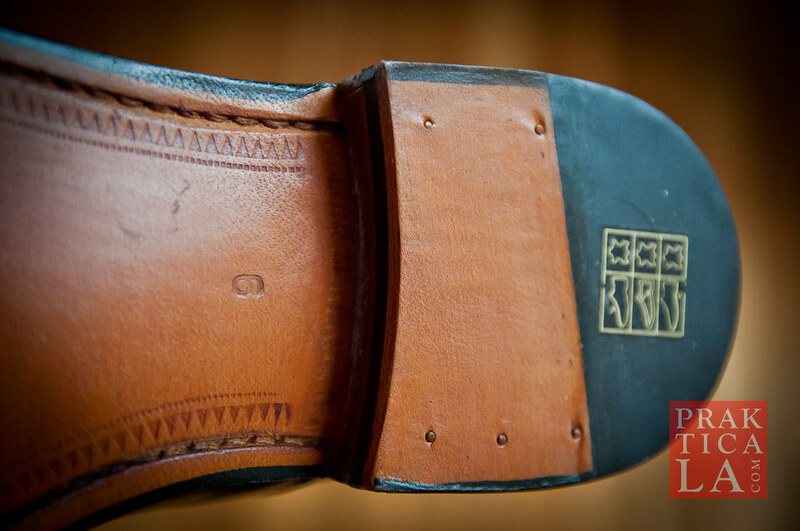 Welted soles are also replaceable, unlike cemented ones, which further extends the life and usage of a good shoe. Leather soles and Goodyear welted construction. That said, I found the leather on the Caine oxfords to be a bit thinner than some of the other high-end shoes I’ve seen. That’s not a serious issue, and I still think the quality of the leather is good, and expect to get lasting performance from it, but it is noticeable nevertheless. On the other hand, the shoes are very comfortable and flexible right away upon trying them on, and lack the stiffness and discomfort that many dress shoes have before they are broken in. The sizing was a little confusing: other reviews suggested ordering a half to full size down; as I normally wear US size 10 or 10.5, I asked for a 9. Santiago emailed me back and told me he would send me a 10 and a 10.5 since they had updated their sizing recently. When the shoes arrived, the packing slips indeed said 10 and 10.5, but the shoes themselves had 9 and 9.5 imprinted on the soles. I assumed that these were the UK sizes. In any case, the pair that ended up fitting me best was the smaller of the two. 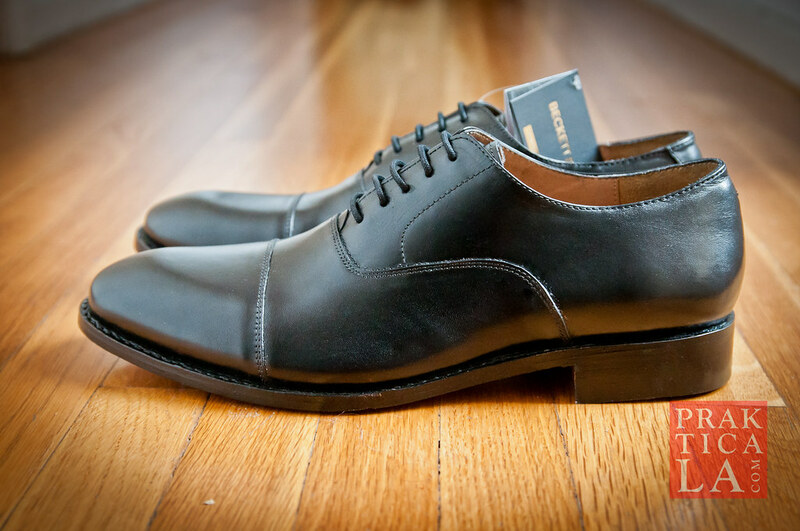 The leather looks great, and the design is classic oxford. I might have liked the shape to be just a little narrower, as is the slim-look trend right now (and since I have relatively narrow feet). Still, it’s hard to go wrong with a timeless black cap-toe lace-up. With closer inspection, I did notice a few small details that were rough or missing. For example, the dressing along the outsole, while nice, is a little inconsistent; on a $400 shoe, I’d bet that black lines along the edges would be smooth and even. And the heel is missing the “notch,” the small inside corner of the heel that is cut off to prevent it from snagging on the wearer’s pant cuff. These are more cosmetic than functional issues, but it’s attention to small details like these that differentiate these shoes from more expensive ones. Note the lack of a “notched” heel and the slightly uneven dressing along the edges. The glue attaching the heel to the sole is a little rough; observe the slight gap between the two. 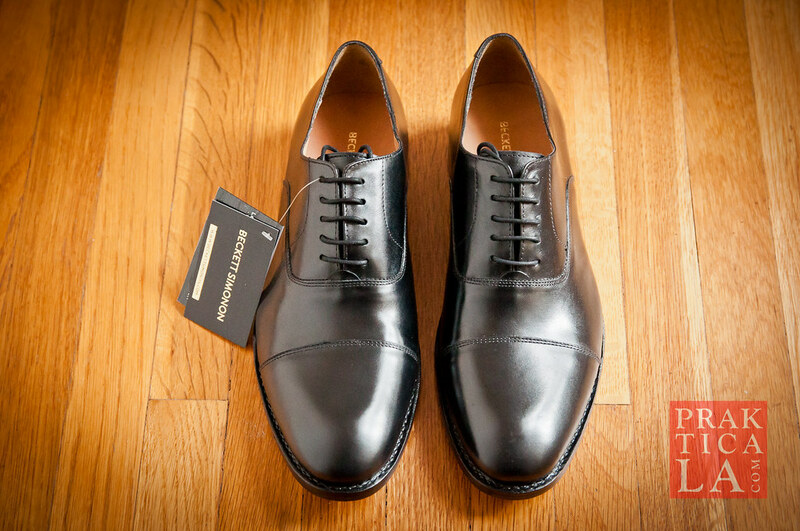 Although the shoes don’t quite compete toe-to-toe with well known high-end designer shoes, the comparison is a little unfair as those brands can cost upwards of double what these do — all the offerings on Beckett Simonon’s site are priced well under $200. At that price point, these seem to be a really good deal, especially considering that they feature full grain leather and Goodyear welting. While a bit rough around the edges, in all honestly no one will notice unless they yank the shoes off your feet and hold them up to their face for close scrutiny. If you’re tired of dealing with janky shoes that wear out and/or look like crap after a season, like I am, these are definitely worth a shot. I’m certainly curious to try some of Beckett Simonon’s other designs on, like their brown monk straps (which are currently sold out in my size). I’ve got a few more shoes to review, so stay tuned. 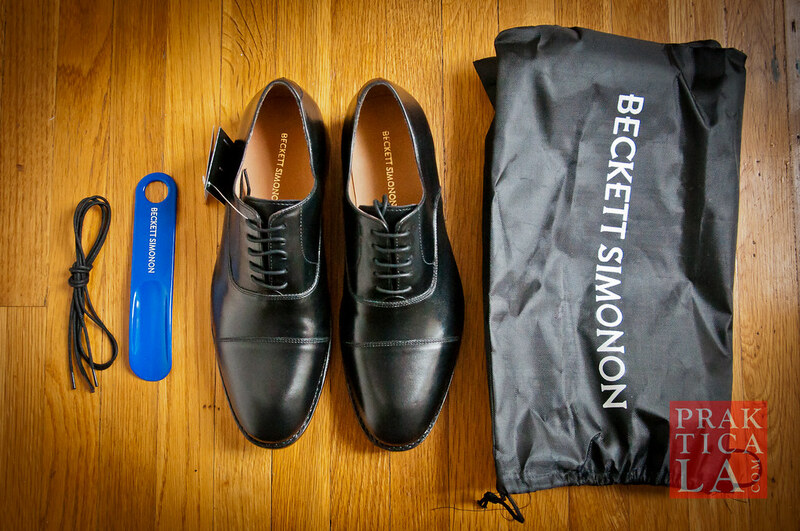 In the meantime, does anyone else have any experience with Beckett Simonon? What are your thoughts? EDIT (10/05/2015): See our review of the Cohen loafers, from Beckett Simonon’s current line of shoes, here. And click here to read about their new line of premium shoes being funded on Kickstarter. I just got my pair on the 2nd. I take a 10.5 M (D) US in pretty much every shoe. I got the 10.5 which as you pointed out are marked 9.5 (UK). Honestly, I am finding them slightly tight and the vamp just a bit too snug. They are difficult to get on with the included plastic shoehorn, but slightly better with a metal one. Once on the length is good, maybe a little on the long side. Basically I think if you have a wide foot you would be out of luck with these. My foot is just at the limit. That said, the fit when on is actually the fit I used to look for in new boots and shoes when I was in the military, because when they break in the will be comfortable without “slop”. So as I write this I’m sitting with them on and laced tightly wearing what were when I put them warm and wet sport socks…now just wet. I can feel the shoes start to form and think I’ll be happy with them when the vamp area gets a little broken in. Other than that, quite happy with them, the quality is solid, especially at the price point. They often run 20-25% off coupons making the shoes closer to $120 than the $149 price point and at that price they are a solid buy. So I wore them a couple of hours and walked down my driveway to my post box. My driveway is rough cement and it is about 100 yards round trip. The thread holding the sole on are located in a channel to protect the threads…but the channel is not deep enough and after that short walk on the cement the thread is already wearing through. In daily walking use, this will be a problem. The choices are to get a rubber pad to cover them and protect…which in my mind defeats the joy of having leather soles…or expect to end up getting them repaired in short order. I sent a email off to Becket Simonon, I am interested in seeing how they reply. As the shoes are marked from the walk, according to their web site they are not eligible for return…but they do have a one year warranty. Thanks for the comments, Chris! Will definitely be interested to hear from you about how they how they hold up long term. 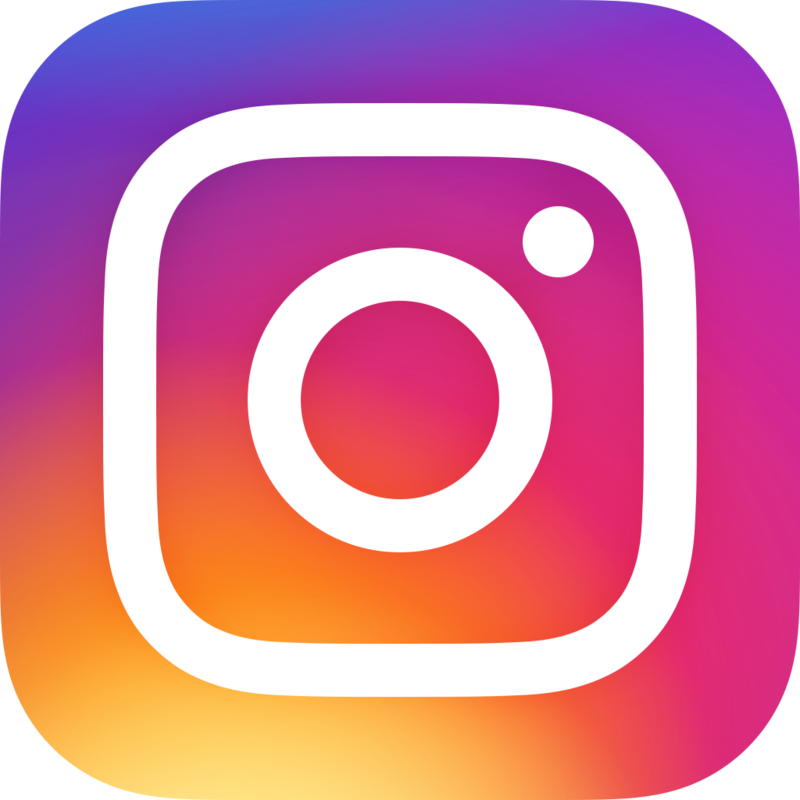 Keep us posted! Hi Corey! Thanks for your comment. The new Caine oxfords look great – looking forward to hearing how you like them!